Note #1: This product has been given a Desperation Morale CONSUMER ALERT warning and DO NOT BUY recommendation. Note #2: this write-up is especially lengthy because it investigates at length the relationship between Lion of Judah and an earlier ASL third party product, Soldiers of the Negus, for which Critical Hit has no reprint rights. Click here to skip all this and go to a “standalone” summary. Lion of Judah (LoJ) is an astonishing product, but be sure to read on, because the use of the word “astonishing” here is not a compliment, but rather used in its sense of causing surprise or amazement. 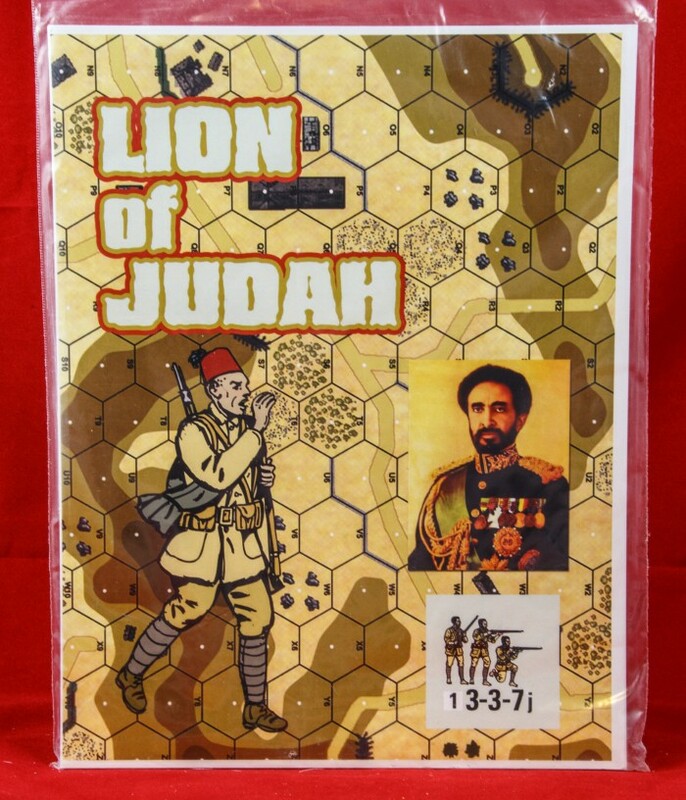 Essentially, Lion of Judah is a fairly blatant attempt to release a new version of Soldiers of the Negus, an old third party product which Critical Hit once reprinted, but to which it no longer has the rights–while seemingly trying to skirt legal issues related to intellectual property. Soldiers of the Negus originally debuted in 1994 as an early third party publisher scenario pack from ELR. It was one of the first third party scenario packs and one of the first serious attempts to take ASL beyond the boundaries of the Second World War by taking ASLers to the Italo-Ethiopian War of 1935, when Mussolini’s soldiers conquered the kingdom of Ethiopia, one of the only parts of Africa that had successfully resisted European colonization and remained independent. The scenario pack included some rules, eight scenarios, and unmounted counters representing the Ethiopian troops and more. In 1996, Critical Hit was given permission by ELR to reprint Soldiers of the Negus. 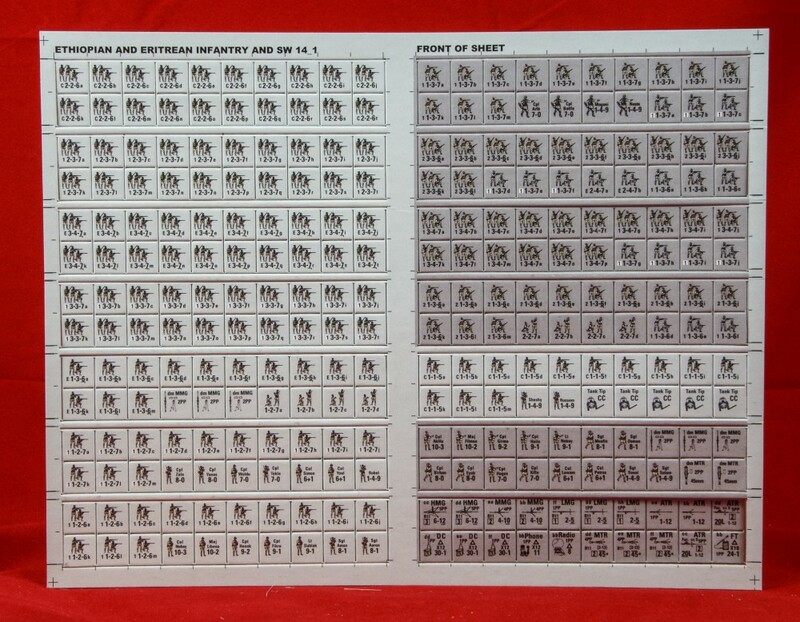 The Critical Hit edition of Soldiers of the Negus basically had the same components, but Critical Hit replaced the unmounted counters with a full sheet of die-cut counters, which made the product quite desirable at a time when non-official counters were very rare indeed. It also polished the rules. Whatever happened to the “unrelated submission on the same topic” is a mystery, as Critical Hit has made no reference to it since, but the company’s interest in SotN may have been energized a few years later when MMP announced in the summer of 2011 that its upcoming new edition of Hollow Legions would actually include a new version of Soldiers of the Negus as part of this official module. MMP had apparently obtained the rights to the product from designer Rick Thomas. Within the LoJ rules, however, Critical Hit was more explicit in explaining LoJ’s derivative nature, even twice proclaiming it a “new edition.” This “new edition,” stated Critical Hit, “uses concepts from CH’s edition of ‘Soldiers of the Negus’ but past designers were not consulted on changes made herein.” The scenarios (or “actions central to the battles of 1935-36”) were “re-imagined using new…desert geo boards and overlays from the 2014 Desert War release.” Apparently, Critical Hit believes that it is free to release a “new edition” of Soldiers of the Negus as long as it “re-imagines” enough aspects of the original. How similar is LoJ to SotN? The answer is pretty darn similar. Let’s take the various components in turn. This can sometimes get a bit complicated, as there is the ELR SotN, the CH SotN and then LoJ. The CH SotN has a few changes from the ELR SotN (as well as some re-writing for clarity and quality). It is not clear which party instituted those changes, so to be conservative, it is assumed that CH made them. Neither version does much with terrain. The LoJ rules eliminate the Candelabra Trees terrain of SotN, which Ray Tapio claimed were “cumbersome” (though they consisted of only eight sentences). That is really the major difference in the rules, which isn’t much. The next rules section for both introduces the Ethiopians. ELR SotN introduced a 3-4-7 Ethiopian elite squad, with a 1-3-6 half-squad. The CH SotN also had this, but added underlined morale (in the rules, not on the counters). LoJ also introduces a 3-4-7 Ethiopian elite squad (with underlined morale) and a 1-3-6 half squad. ELR SotN has a 3-3-7 Ethiopian (boxed) 1st Line squad, which ELRs to a 2-3-7 (non-boxed) 1st Line squad, which ELRs to a 2-2-6 conscript squad. 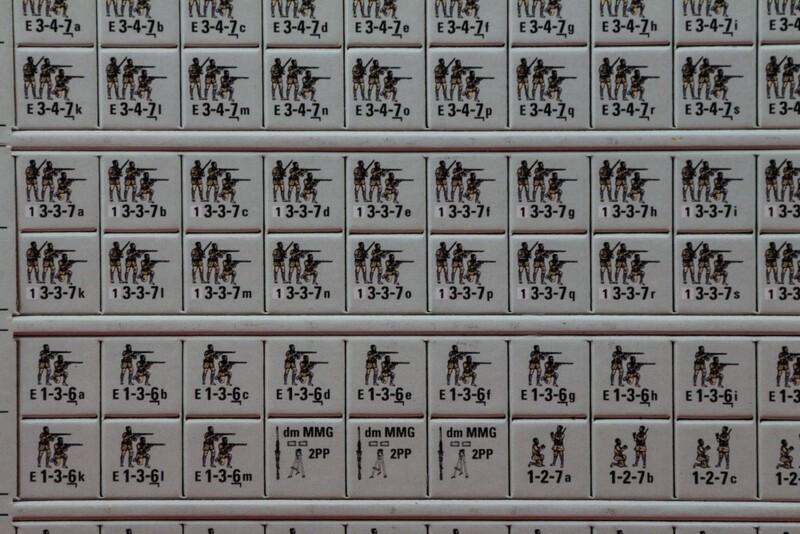 The ELR SotN 1st line (boxed) half-squad is a 1-2-7, which ELRs to a (non-boxed) 1-2-6, which ELRs to a conscript 1-1-5. The CH SotN also has all this. So, too, does LoJ. Obviously, if this had been an original design, the odds of all these values being the same would be very low. Clearly, the LoJ version copies the SotN values. The ELR SotN Ethiopian rules have a paragraph describing how their CC attacks become Hand-to-Hand and how they get an additional -1 DRM. The CH SotN essentially has the same, just reworded. So does LoJ, with the exception of a parenthetical addition that makes no sense and seems to have been a mistake. All sets of rules make Ethiopian MMC subtract one from their CCV. Both sets provide a rule for Ethiopians overturning tiny Italian tankettes, only SotN versions call it a “Tank Flip Attack” and LoJ calls it a “Tank Tip Attack” (really). Critical Hit claims that this rule was “streamlined” in LoJ. The rules are reworded but are essentially the same as in the SotN version. ELR SotN provides a design note related to these flipping attacks: “It is unknown who cooked up this idea to deal with the small Italian tanks. Most likely it was improvised on the spot. Nonetheless, it worked well with the traditional Ethiopian massed attack, and was used to good effect on several occasions.” The CH version of SotN slightly rewords it: “The origin of this tactic to deal with enemy armor is unknown. Most likely it was improvised ‘on the spot’ during a battlefield engagement. No matter the origin, it was a viable tactic and was used to effect during the classic Ethiopian massed rush attack on enemy soldiers and vehicles.” LoJ has the same paragraph. CH SotN has the same Steer quote, with the word “author” added: “Author George Steer wrote of the Ethiopians,” followed by the same quote about Ethiopian mass attacks. LoJ also allows Ethiopians to make Human Wave attacks. It ALSO provides a related design note, stating that “author George Steer wrote of the Ethiopians,” then includes the exact same Steer quote and the exact same sentences that the designer of SotN followed it with. ELR and CH SotN rules regarding Ethiopian SW usage are essentially the same. LoJ has the same rule, too. Ethiopian Ordnance rules are the same in all three. All three have the same special captured use penalties. They all have the same Fire Group rules. They all have the same HOB and Leader Creation rules. Basically, except for the elite underlined morale, the Ethiopians are the same in all important respect in ELR SotN, CH SotN, and LoJ, even down to the designer notes (LoJ has one additional designer note to reflect added “bonus” captured Italian tank counters). In addition to Ethiopian troops, SotN provides rules for Eritrean troops, who fought as Italian auxiliaries. 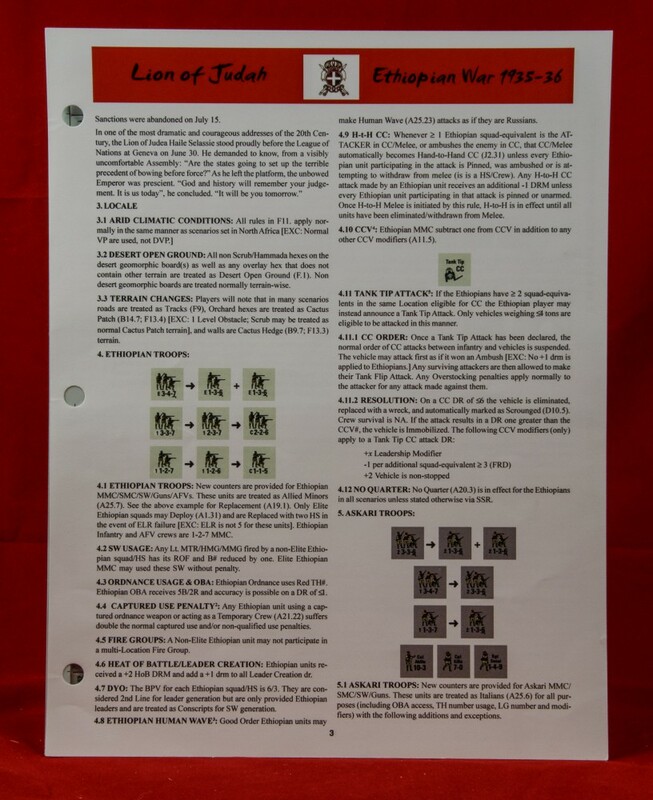 Though differently worded, the rules for Eritrean troops in the two SotN versions are the same, except that the CH version reduces their broken side morale by one and adds some special Battle Hardening and ELR failure rules. LoJ renames these troops “Askaris,” but they are otherwise essentially the same as the CH SotN, with the exception that the broken side morale provision was removed, making it the same in that respect as the ELR SotN. So LoJ “Askaris” are basically the same as ELR SotN “Eritreans,” with the exception of the Battle Hardening/ELR failure rule. All three products come with 8 scenarios. Obviously, the scenarios are the same in the two SotN versions, with minor tweaks to some of the historical texts, victory conditions, OBs, and SSRs. But how similar are they to the LoJ scenarios? SoN5 Circle the Wagons! LoJ5 Tankette Rampage NOT the same scenario. The LoJ scenario is actually a revised version of CH37 (Forgotten Years) from Critical Hit Magazine #3. Desperation Morale is not a law firm and cannot determine whether this “re-imagining” is sufficient to withstand a challenge of copyright violation. Is it legal? Don’t know. But a more important question is this: Is it ethical? And the opinion of Desperation Morale is an emphatic and resounding NO. What Critical Hit has done here is not ethical. It is not moral. 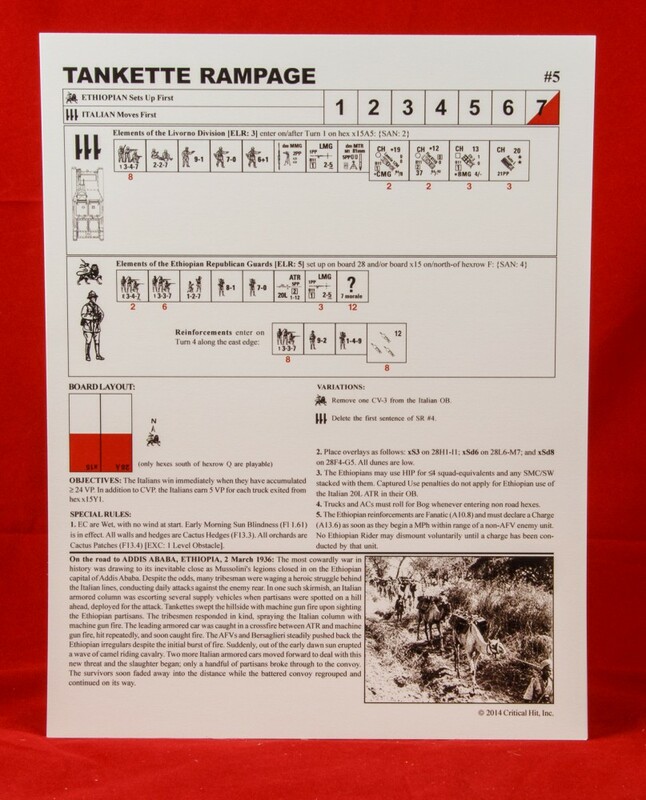 Critical Hit could have done the research and the playtesting and the development to create its own, original product on the Italo-Ethiopian War. By doing so, it would have benefited the ASL community. However, Critical Hit did not choose to do that. Instead it chose to create a mutant clone of another person’s design to which it not only did not have the rights, but which is slated for publication in a future product by another company. Such a move does nothing but hurt the ASL community–and does nothing for Critical Hit’s already poor reputation. For this reason, as well as some of the reasons listed below, Lion of Judah has been given a Desperation Morale CONSUMER ALERT warning and a DO NOT BUY recommendation. What follows below is a brief write-up of Lion of Judah with minimal reference to the above. Lion of Judah (LoJ) is a Critical Hit scenario pack that is essentially an unauthorized variation of a previously published product, Soldiers of the Negus, which itself will see print in the upcoming new edition of MMP’s official module Hollow Legions. ASLers are encouraged to wait for that module or to seek out the original pack. LoJ requires ownership of another Critical Hit product, Desert War: 1941, in order to play its scenarios. Desert War: 1941 is a recent (as of this writing) large attempt by Critical Hit to “do” the desert (consigning its also-recent predecessor Afrika Korps series to oblivion and stealth recycling). It costs over $100. Ostensibly, LoJ also requires boards from the Sweet 16 Geo Board Collection, which goes for around the same price (and also has a CONSUMER ALERT warning). However, it may perhaps be possible to use standard geoboards 1, 10, 12, and 15 instead, if one wants to risk it. Either way, one has to spend a lot of money to play what LoJ has to offer. And LoJ itself is going for around $55 to $60 right now. For that huge chunk of change, here is what you get: 4 pages of color rules (half of which is historical summary), some die-cut counters (more on that below), and eight scenarios. The rules and scenarios all deal with the subject of LoJ, the Italo-Ethiopian War of 1935-36. They introduce Ethiopian troops as well as Eritrean auxiliaries who fought for the Italians. The scenarios typically use desert rules, so ownership of West of Alamein and Hollow Legions is also necessary. No developer or playtester has been listed and it is not clear if these re-worked designs have been playtested. The scenarios are not complicated, other than the inherent complications of the Desert rules, but are all pretty large. 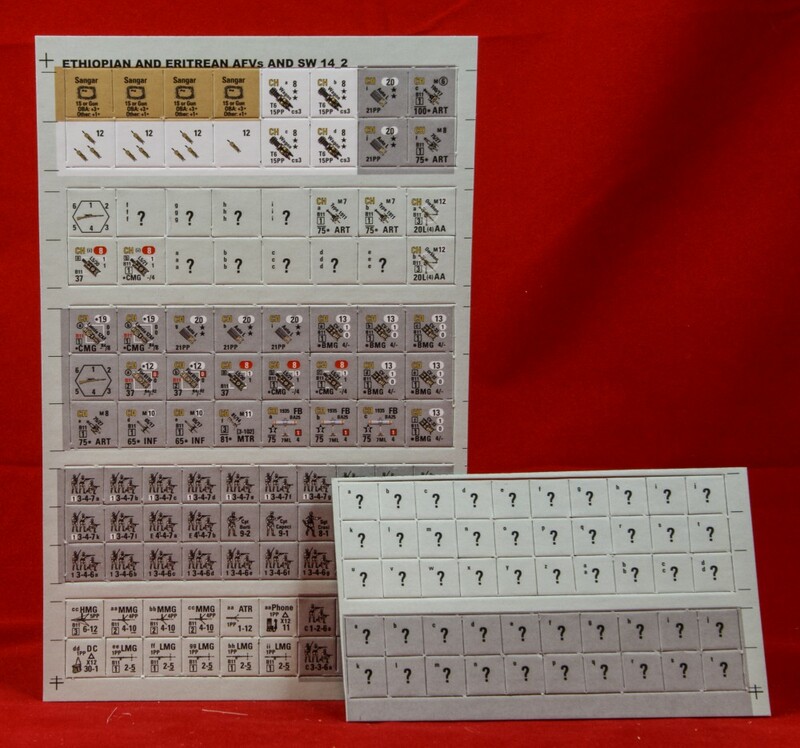 LoJ comes with one full countersheet, consisting of the Ethiopian OB and “Eritrean” counters, which are essentially just Italian counters with different art work. A half-sheet of 5/8″ and 1/2″ counters provides some duplicate Italian counters and a handful of Ethiopian counters. A tiny partial countersheet provides some concealment counters. 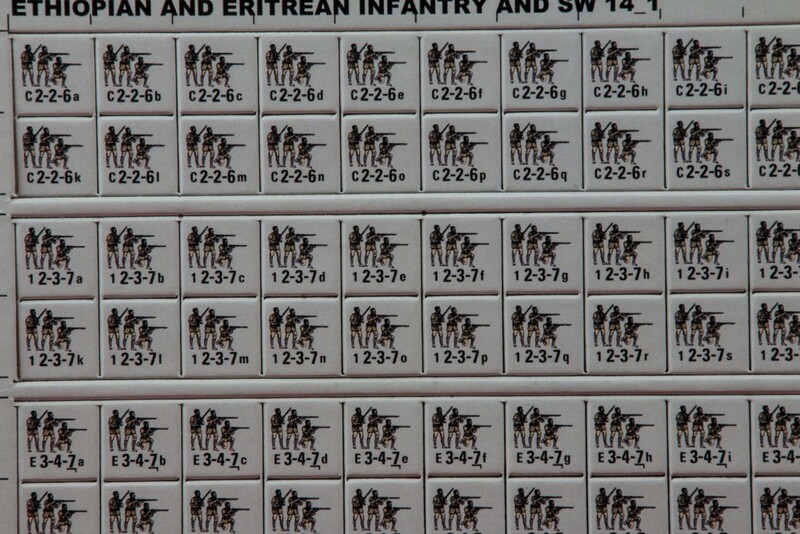 Unlike many recent Critical Hit publications, with this product, many of the counters (the Ethiopian ones) actually are needed for play, as opposed to being just duplicate counters. 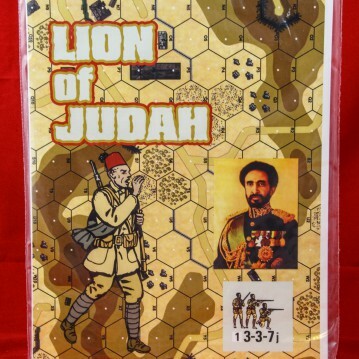 For a product with only 8 scenarios and some counters, Lion of Judah is highly overpriced and thus not worth getting, even leaving aside all of the ethical/moral considerations. Avoid this one. Yes, all you right may be true. But if the game is no longer available and the original designers are no longer around or have a vested interest, then who is hurt? I’d tend to agree with you if there were an extant publisher, but as things are now, I am not sure your ethical outrage makes sense. In any event, I have bought the game and will give it a go. Thanks. Really? After all, the game is not “no longer available”, but was announced as a forthcoming release when CH decided to suddenly release their version. And are the original designers in fact “not around”? Was there an attempt by CH or its representatives to contact them to see if they had a “vested interest”? If the designers are still among us, CH is violating not only ethical principles but copyright laws by not making at least a good faith effort to contact the parties involved and potentially affected. It’s not a matter of “hurt”, but law–and that’s something the law DOES address: the harm that’s done when someone appropriates the inventions of others. Which is what CH did here. Moreover, did Mr. Tapio reach out to MMP and see, say, what might be done for a joint release? Was he given legal permission by all parties to proceed? Doubtful. Very doubtful, especially as he hasn’t indicated anything of the sort. And why doesn’t Mr. Tapio come clean and explain why, on the eve of the re-publication of the original game, he felt the need to preempt and re-release something which he likely no longer had the rights to? The timing is very suspicious. Perhaps we shouldn’t be surprised, for this is a pattern with CH and so many of their practices. It’s bad enough that they reprint their own games and give them new titles in the apparent hope that customers, both old and new, won’t notice. But to take material that belongs to the ideas and innovations of others and try to disguise the attempt (e.g., the scenarios here, and the “Across the Aller” packs) speaks to a larger pathology at CH that’s as disturbing as it is unprofessional, even bordering on the pathetic. No one in the ASL community–or wargaming in general–is well-served by what CH has done here. Mr. Tapio owes a lot of people an apology, or at least an explanation and probably compensation. His silence on the matter speaks volumes.